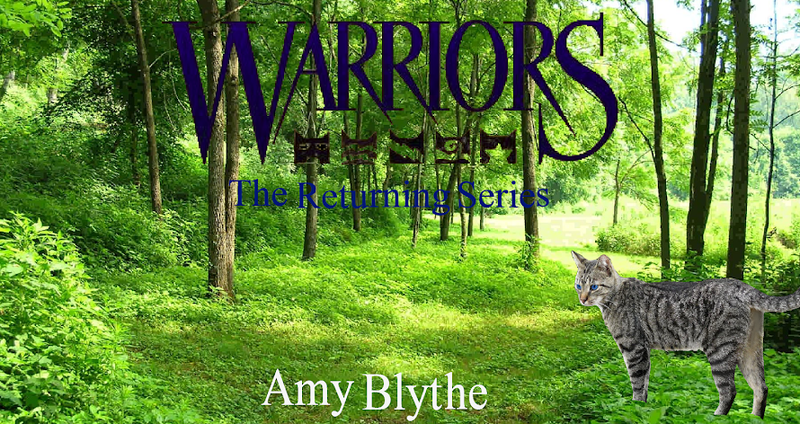 Warriors: The Returning Series by Amy Blythe: What to do, what to do?!?!?! Okay, this is really heartbreaking to say, but I thought of the title "Blue Skies" first and...well...I don't want you using it. It truly breaks my heart to say it, but it just doesn't seem right to have two books with the same title, by different authors. For more proof go to: http://warriorsreturns.blogspot.com/2012/11/different-book.html As you can see, I posted it on my blog on Wednesday, November 28, 2012, which was 19 days before you thought of that title. I do hope you understand how heartbreaking it is for me, but you must understand. Please. What should I do?!??! Blue Skies is the PERFECT NAME! But now. . .
Oh, and I've decided to keep the name "Warriors: The Returning Series" (: But thanks for all the ideas, guys! Philly Wood, no time to reply tot he comment, but I saw the banner you made me! It's EPIC! But the thing is, I'm not going to use it until I get the book name resolved... but it is awesome! thanks! I think you should do what you think is right. Not anyone else. Just YOU. Starry skies??? possibly, im thinking soooooooo hard! Something to do with ***Clan??? possibly? p.s. I think you'll understand ***Clan??? I think you should tell Ella to call hers Azure Heavens and keep yours as Blue Skies. I'll talk to her.